The Ferretti 670 is the first gift from the shipyard to itself in celebration of it’s golden 50th anniversary. Officially presented at boot Düsseldorf, the fantastic flybridge has taken the style, comfort and performance that have always been part of the brand’s DNA to an even higher level. The WSB Team take a closer look at this golden age arrival. A product of the partnership between the Ferretti Group’s Engineering Department and its Product Strategy Committee, it is the first Ferretti Yachts creation with an exterior to be jointly designed by the Ferretti Group and the architect Filippo Salvetti. The interiors are by the Group’s architects and designers. The Ferretti Yachts 670 is the natural heir to the shipyard’s popular 65-footer and manufacturing work will start on the first unit in January 2018. As part of a smart evolution process, it will combine some of the characteristics of the models launched in 2016 and 2017 (Ferretti Yachts 450, 780, 850 and 920) with some significant new features. They include exceptional space optimization in both the interior and the exterior, which instantly catches the eye and offers owners and their guests the perfect blend of socializing and independence. The Ferretti Yachts 670 measures 67 feet (20.24 metres) but it boasts a number of solutions that tend to be associated with larger vessels. The approach taken is plain to see from the layout: the standard version has 3 very sizeable cabins on the lower deck. The sleek lines and clean-cut shapes of the aerodynamic exterior design follow in the wake of the success enjoyed by the last Ferretti Yachts creations to be presented in 2017: the 780 and the 920. To the stern there is a large swimming platform with a vertical tender lift that can accommodate a 3.5 m jet tender. Among the distinctive features in this area are two storage compartments: one in the upper part and one in the lower part of the stern sofa. A Seabob can be kept in the latter. A truly innovative space optimization solution can be found in the outside forward area: three substantial sofas face each other and dominate the large living area, making the most of the potential for relaxation. On request, it is possible to put two dining tables facing each other alongside the side sofas. They can also be converted into relaxation surfaces, making the whole area into one big sun pad. With approximately 25 m² of surfaces, the large flybridge is the most competitive in its class. Free-standing furniture can be chosen in the stern and there will be a fully equipped bar on the left of the central zone, facing an entertainment area with a C-shaped sofa and a dining table. Heading forward, you come to a second control station on the left and then a very large sun pad. Ferretti Yachts proposes 3 different layouts for the flybridge: a standard open version, a version with a roll bar for the satellite systems that can also accommodate a bimini top, and a hard top version. A glass door in the cockpit opens up onto the main deck lounge, where there are two big sofas either side of a central coffee table. Further along is a dining area with an open galley and a dining table opposite it. Past the galley is the helm station: a cutting-edge technical area with integrated instrumentation for monitoring the main functions, as inspired by the innovative solution found on the Ferretti Yachts 780 and 920. 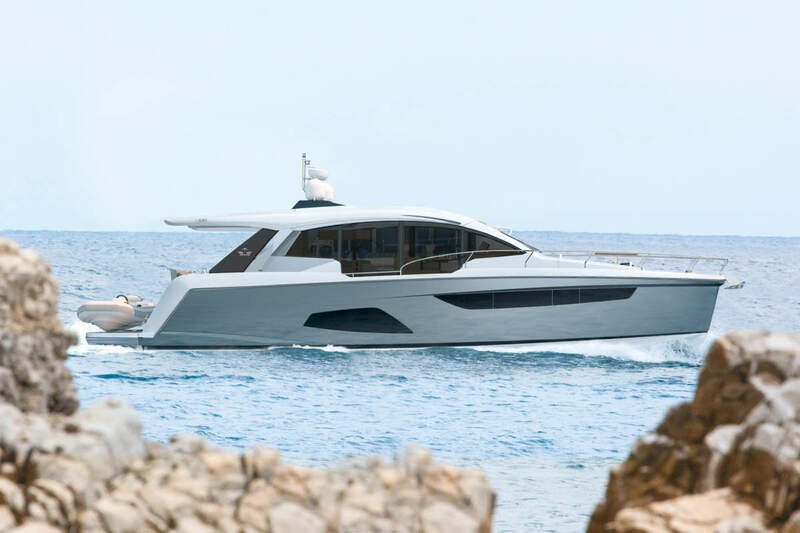 Another noteworthy feature is the new electro-hydraulic steering system that has already been seen on other recent creations by Ferretti Yachts. Among its many benefits are greater steering comfort thanks to the extremely easy handling of the helm and maximum efficiency when turning, even at high speeds. Below decks, even in the standard version there are 3 cabins, thus underlining that the goal of optimizing space has been achieved. The owner’s suite is located in the centre of the yacht. It has a large study that acts as an antechamber. The bed is in the centre of the room, and towards the stern behind it are a walk-in wardrobe on the port side and a large bathroom to starboard. This layout offers better soundproofing against the noise from the engine room, which is another significant benefit of the design. There is the option of replacing the study next to the owner’s cabin with a fourth, smaller cabin or a laundry room. On the starboard side there is a double cabin, while the foredeck is home to the VIP cabin. Both have a bathroom and separate shower. On the lower deck there is also a crew cabin with a bathroom. It is at the far end of the stern and it has easy access to the cockpit thanks to built-in steps. The interior design is inspired by Oriental trends and a big part is played by linear units and strips of wood, with contrasting light and dark hues. Wood, leather and lacquered surfaces are the materials of choice. A number of metal items in the lounge and bronze glass pieces in the owner’s cabin have a big visual impact. A special Tai He Ban version of the Ferretti Yachts 670 will be available especially for the Asia Pacific market, with the galley below decks and an “entertainment room” on the main deck. The Ferretti Yachts 670 will be fitted with twin MAN engines rated at 1000 mhp, giving it a cruising speed of 25 knots and a top speed of 28 knots (preliminary data). Alternatively, customers can order twin MAN engines providing 1200 mhp, for a cruising speed of 28 knots and a top speed of 32 knots (preliminary data). The 670 marks a very special moment in the Ferretti story, and they have executed it with perfect precision. One thing is for sure, the Ferretti Group and its stable of world renowned brands has the ability to continue writing the next 50 years of their story.